One of Mr Cake's favourite childhood desserts was apricot upside down cake. The version he had growing up was a microwave version, he thinks from the Edmonds cookbook (classic Kiwi fare right there) and would have featured tinned fruit. 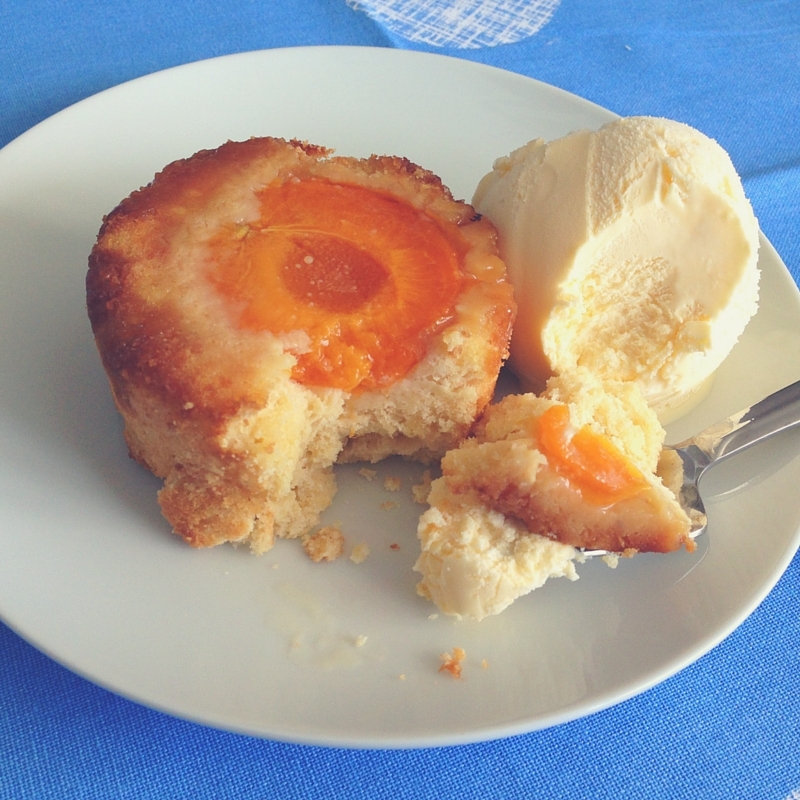 With the plethora of apricots about at the moment (aren't they good?) I wanted to make a slightly flasher version - while Edmonds recipes are generally pretty solid, they also tend to be basic. I spent a bit of time hunting for a recipe that sounded just right, and this one, which I've adapted a bit from NZ House and Garden, met with the judge's approval (and mine). It uses almond meal, orange zest, and a tiny hint of ginger to spice things up a bit. The almond meal gives the cake a denser, coarser crumb too, which I think makes for a perfect pairing with ice cream. 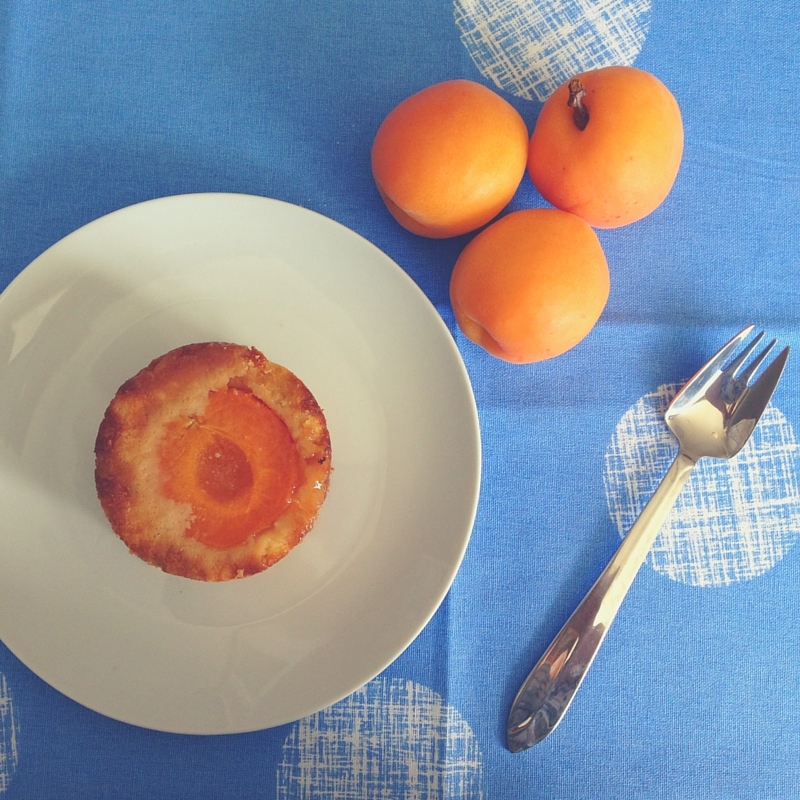 The apricots cook into soft, tart, fruity perfection at the bottom of the cake. 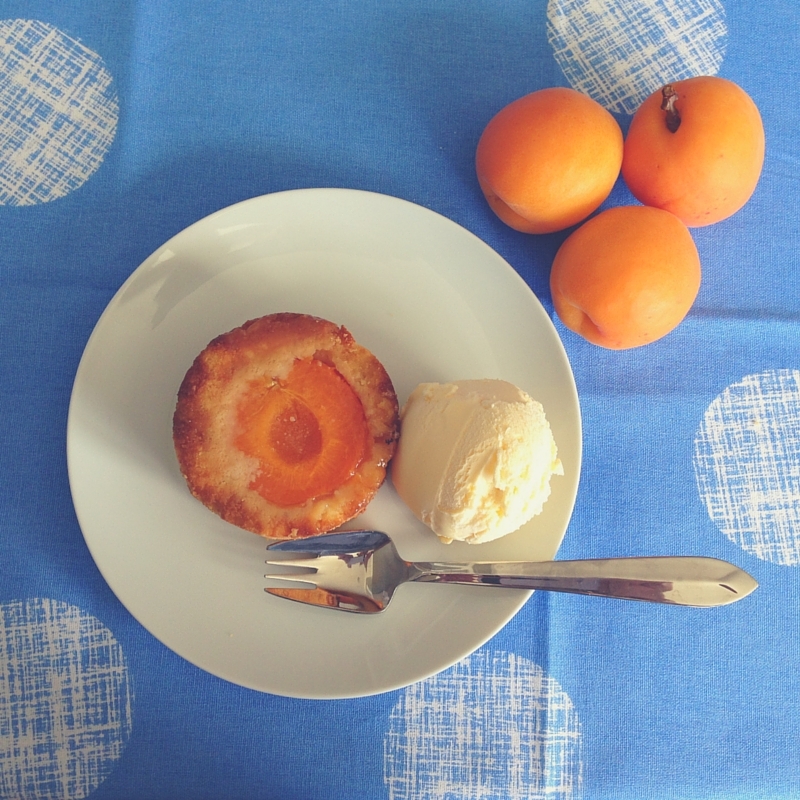 I don't know how cooking magically adds that extra tang to sweet, fresh apricots but it's a win. If you aren't keen on the idea of having a hot dessert with ice cream (really? Are you sure?) it'd be perfectly delicious as an afternoon tea cake too. It will dry out quite quickly as there's not a huge amount of moisture in it, so if you want it to last drench it in a sugar syrup (one infused with orange zest would be wonderful). It'd also be fine made with tinned apricots if you're making it at another time of year - or indeed many other types of fruit would translate well, so if you'd prefer, say, plums or pears go for it. Or you could even go full 80s classic and opt for tinned pineapple rings - don't forget to garnish with glace cherries at the end! If you use a springform cake pan make sure you line it with enough baking paper to reach at least 2cm up the sides at the bottom of the pan. If you don't, you risk losing all the delicious glaze to the bottom of your oven, which is a double-edged sword; not only do you not get to eat it, but you'll get a house full of smoke and a bonus oven-cleaning chore to add to your to-do list. Not that I would have done anything so silly, of course. I like single serve desserts so the recipe gives options to make one large cake, or do portioned ones in ramekins (or you could even use a muffin tin in a pinch). I expect these will freeze well if you want to save some for later, and I can verify that they last a few days in the fridge and reheat very well given a 30 second blast in the microwave. Are there any classic desserts from your childhood that you haven't had for a while that might be worth dusting off? Heat oven to 180 C. Grease and line the base of a 23cm cake tin, or 8-10 ramekins or small dishes. If using a springform tin use baking paper large enough to come at least 2cm up the sides of the tin to prevent the glaze from leaking out during cooking. For the glaze, melt the butter and combine with golden syrup and brown sugar. Spread over the base of lined tin/dishes. Arrange apricots over base, cut side down. For the cake, cream together butter, sugar, vanilla and orange zest. Add eggs one at a time, beating after each addition. Fold in ground almonds, baking powder, ginger and half the flour. Fold in the buttermilk then the remaining flour until just combined. The batter will be very thick. 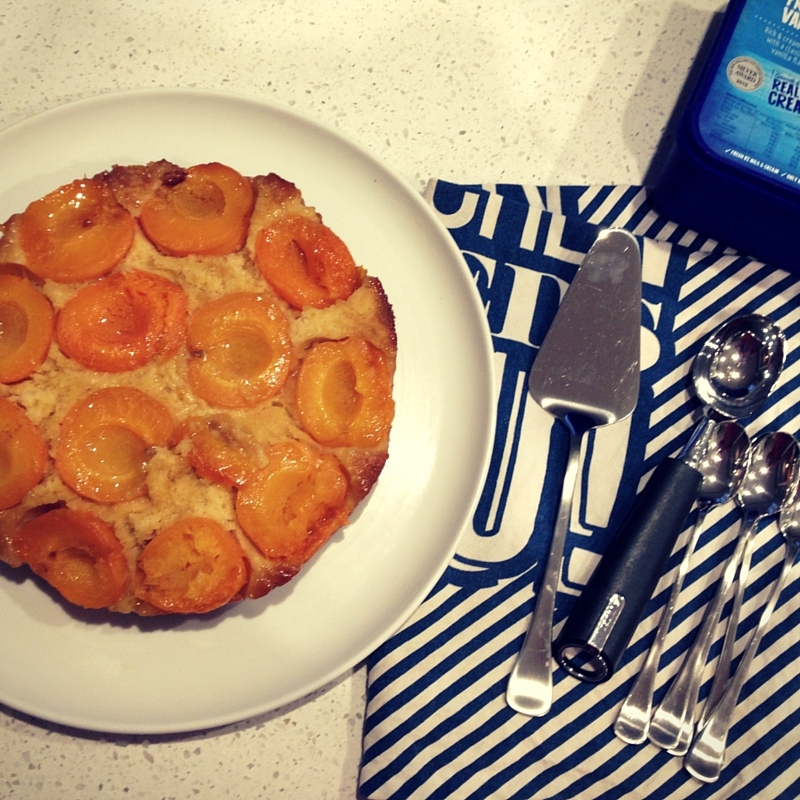 Carefully spread cake mixture over apricots. For a large cake, bake 45-50 minutes; for smaller ones bake for 15-20 minutes; or for both until a skewer inserted into the centre comes out clean. Serve warm with ice cream, cream or yoghurt. Looks like a great idea, it looks so mouth watering!